You are not alone. I have those days too. All of the time. Those days where everyone is driving you crazy; your toddler won't listen, your baby wants held the entire day, hubby has to work late so you are alone with the kids for 12+ hours...oh and this morning you realized you were out of dry shampoo so you are feeling greasy and gross on top of the frustration and exhaustion. How do we live this out on those days when we want to hide in the bathroom with Netflix and a pint of ice cream? Joy is defined as “the emotion of great delight or happiness caused by something exceptionally good or satisfying; keen pleasure; elation: (dictionary.com).” So how can we get that “that emotion of great delight”? Click here to share this image on Twitter. Let’s get real, no matter how hard we try, we are going to mess up and complain and yell. We’re humans, it’s unrealistic for us to expect that we will always be filled to the brim with joy. This is where grace and forgiveness come into play. Imagine those days where you’re just done, I have them more often than I’d like to admit. You just want to be left alone and don’t want to hear one more fussy sound out of your toddler. 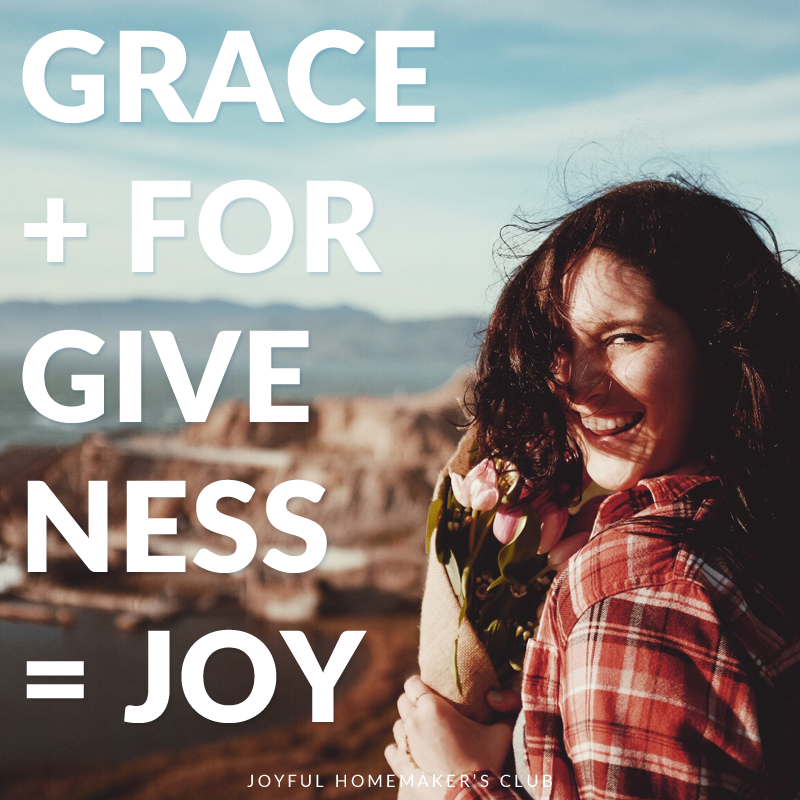 After you finally reset your mind, the only way you can refill that joy meter again is because you know that your family will show you grace and forgiveness. And just as much as they show it to you, you need to show yourself grace and forgiveness. Otherwise, you will fill up with bitterness and that’s just not as fun as joy. I would also love to give you a free scripture study on joy! You can get it from the resource library by clicking here (look in the faith section)! Oh, don’t forget to head over here to see how I organize my scripture studies! P.S. I also made a grace + forgiveness desktop wallpaper, it's available in the resource library! P.P.S. If you love scripture studies as much as I do, join my Facebook group 'The Joyful Homemakers' where I share a free scripture study every single month!